Professor Edward O. Wilson, a man heralded by the National Geographic Society as “the greatest naturalist of our time,” lent his name and vision to a premier biodiversity research facility in Mozambique. 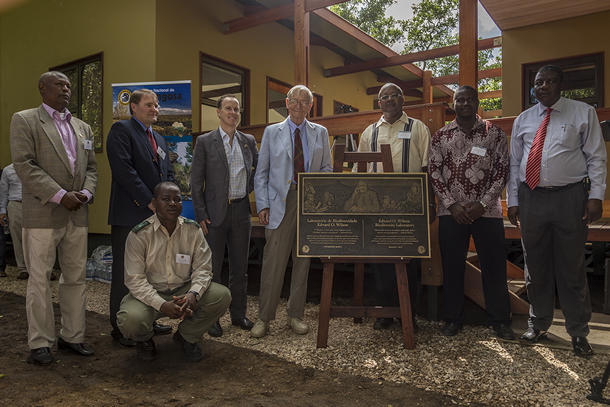 The esteemed evolutionary biologist was a guest of honor at the formal opening of the Edward O. Wilson Biodiversity Laboratory in Gorongosa National Park, Mozambique, on March 27th, 2014. The Laboratory is the first of its kind in Mozambique. From left to right: Top: Bernardo Beca Jofrisse (Gorongosa Oversight Committee); Gregory Carr (Gorongosa Restoration Project President); Douglas Griffiths (United States Ambassador to Mozambique); Professor Edward O. Wilson; Dr. Abdala Mussa (Director General of the National Administration of Conservation Areas); Anibal Nhampossa (Provincial Director of Tourism) and Paulo Majacunene (District Administrator of Gorongosa). Bottom: Mateus Mutemba (Gorongosa Park Warden). Photograph by Piotr Naskrecki. The E.O. Wilson Biodiversity Foundation will be communicating the work of scientists at the E.O. Wilson Biodiversity Laboratory through its partnership with the Gorongosa Restoration Project. Through this partnership, videos that communicate the work being done at the Biodiversity Laboratory will be shared on the E.O. Wilson Biodiversity Foundation website to support participation in the vision and practice of the facility. Each video will introduce the viewer to the activities of scientists who study the Gorongosa ecosystem, and highlight the critical importance of biodiversity in the management and restoration of Gorongosa National Park. 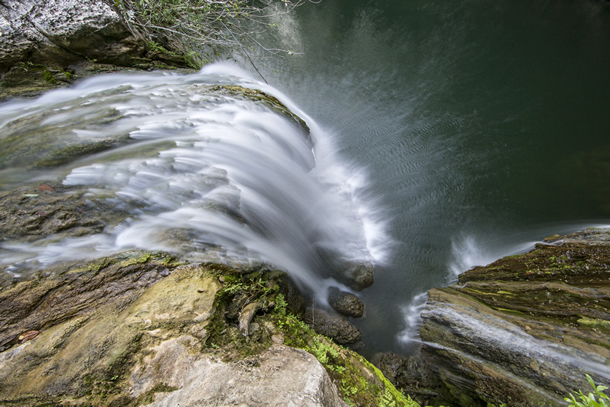 Waterfall at the site of the 2013 Biodiversity survey in Gorongosa National Park.Photograph by Piotr Naskrecki. Professor Wilson conducted a ribbon cutting ceremony attended by Park Warden, Mateus Mutemba; U.S. Ambassador to Mozambique, Douglas Griffiths; USAID Mission Head to Mozambique, Alexander Dickie; and Director General of the National Administration of Conservation Areas, Abdala Mussa. Professor Wilson addressed delegates on the importance of biodiversity conservation and its crucial role in improving human development. “Environmental awareness has grown dramatically during the past several decades. However, the focus has fallen increasingly on the non-living part of the world, in other words, on climate change, pollution, and the exhaustion of irreplaceable resources. At the same time attention has slipped away from the living part of Earth, called the biosphere. The biosphere still has plenty of biomass, but most of it is in the farms and timberlands that sustain the human species. What is declining is biodiversity, the variations of living organisms,” said Professor Wilson. Local women Domingas Aleixo (front) and Celina Dias (back) share their experience of being among the first Science Interns to begin training with the Park. Photograph by Piotr Naskrecki. Gorongosa was badly damaged by a generation of civil conflict in the late 20th Century when large scale poaching occurred. But today, thanks to a restoration project, the Park is well on its way to reclaiming its iconic status. Since the project’s initiation, excellent facilities have been built and large animal numbers have increased by as much as 40%. Professor Wilson has visited Gorongosa three times to conduct research and strategize with Park leaders on its restoration and management. “Professor Wilson has long been the leading force of biodiversity conservation, proving through his work that human life is not only enriched by other species that share the planet with us, but also that our very existence is dependent on the survival and preservation of those organisms. The laboratory we have opened today will help carry this message by exploring and protecting Gorongosa’s biodiversity,” said Dr. Piotr Naskrecki, the facility’s Associate Director. 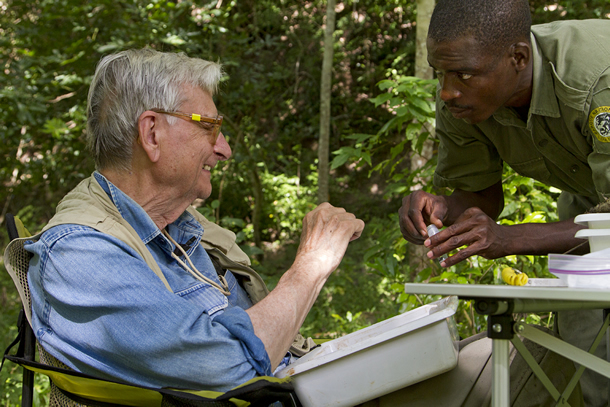 Professor Edward O. Wilson examines ant species with a Park guard. “We are glad that Mozambican scientists and international scientists will work side-by-side, learning from each other,” said Park Warden, Mr. Mateus Mutemba. Photograph by Piotr Naskrecki. “We decided to create this Laboratory because we recognize that the management actions we will take to restore and preserve the biodiversity of Gorongosa National Park must be based upon solid scientific understanding. We are glad that Mozambican scientists and international scientists will work side-by-side, learning from each other,” said Mr. Mutemba. The Laboratory will coordinate a wide range of exploratory and restoration projects ranging from the tracking of lion prides and elephant herds, to measuring the effectiveness of the reforestation effort at Mount Gorongosa. It will provide visiting and resident researchers and students with tools to process, identify and store biological specimens, including long term storage of tissue and DNA material; a DNA extraction amplification facility will also be available on site. 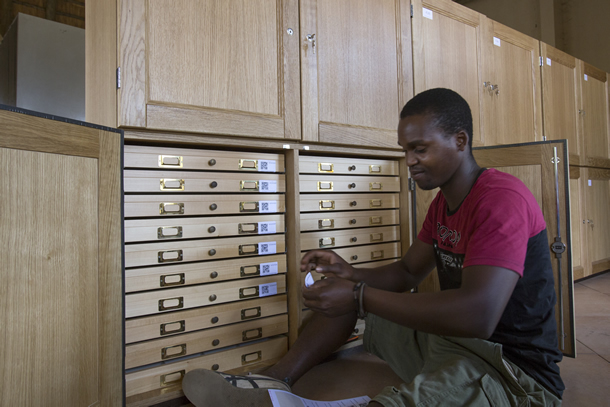 A major component of the laboratory is a synoptic collection of animal and plant species present in Gorongosa, developed in collaboration with Mozambique’s National Natural History Museum in Maputo. One of the Laboratory’s most critical roles is to provide training to the next generation of Mozambican scientists in the Park, and also to send them to universities for advanced degrees. “We hope to help launch the careers of a generation of Mozambican scientists at the E.O. Wilson Biodiversity Laboratory,” said Mr. Mutemba. 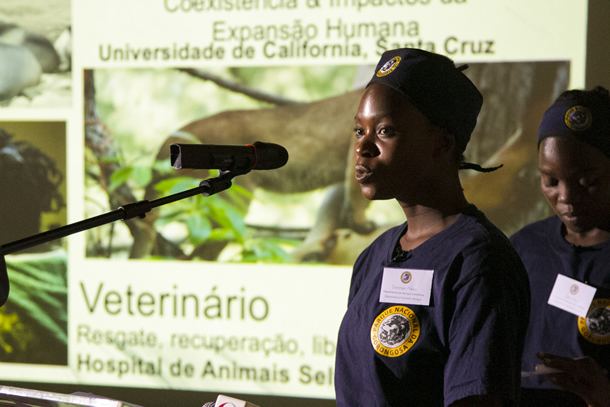 Several students, receiving full or partial financial assistance from the Laboratory, have already begun studying for future careers as veterinarians, ecologists and lab technicians at universities. 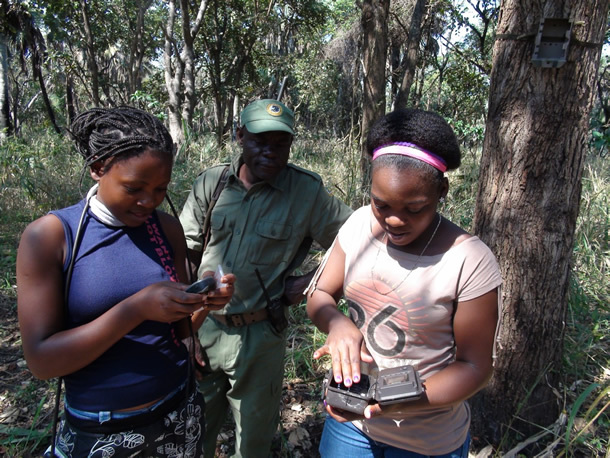 Science Interns, Domingas Aleixo (left) and Celina Dias (right) check remote camera traps while working for the Gorongosa Lion Project. They are the first local women from Gorongosa (and potentially even from Mozambique) to work directly with lions. Photograph by Piotr Naskrecki. The laboratory has attracted national, regional and international attention. Scientists from these institutions have begun working in the Park: Universities of Eduardo Mondlane and Lúrio in Mozambique, Coimbra University in Portugal, and universities of Harvard and Princeton in the USA. In June 2013, a team of fifteen renowned Mozambican and international specialists completed its first major project, a comprehensive survey of animals and plants of the Cheringoma Plateau on the eastern side of the Park. The survey recorded over 1,200 species, including several species unknown to science. Scientists will soon embark on a similar survey of the virtually unexplored region of Dingue-Dingue, focusing of wetland and aquatic ecosystems. A new book titled, A Window on Eternity: A Biologist’s Walk Through Gorongosa National Park, will be released by Professor Wilson, a two-time Pulitzer Prize winning author, in April. Lab technician, Flavio Artur Moniz, prepares for the arrival of biological specimens. Gorongosa’s scientists plan to identify every species in it visible to the naked eye. Photograph by Piotr Naskrecki. Gorongosa National Park is Mozambique’s flagship protected area located at the southern end of the Great East African Rift Valley. The ecosystem was profoundly stressed during Mozambique’s civil conflict (1977- 1992) and immediate post-war years. In 2004, the Carr Foundation, a U.S. not-for-profit organization joined with the Government of Mozambique in a 20-year co-management effort, known as the “Gorongosa Restoration Project” (“GRP”), to restore Gorongosa National Park. The agreement promotes integrated objectives of biodiversity protection and improved human development for local communities. To date the GRP has revitalized anti-poaching teams; rebuilt park infrastructure; conducted biological monitoring; reintroduced bulk grazers: zebra, wildebeest, buffalo, elephant, hippopotamus; established schools, community education centers, medical clinics and agriculture programs. In 2010 the Government of Mozambique expanded the park’s boundaries to include Mt. Gorongosa and it defined a 3,300 sq. km buffer zone around the park. The GRP is helping farmers secure land tenure in the buffer zone and plans to create community owned and managed conservation areas. The Gorongosa Restoration Project is a beneficiary of U.S. Government support through the United States Agency for International Development. Big fan doctor!! Thank you for your life’s work. Would love to work/research with your foundation. Don, thank you for your comment. Your enthusiastic spirit for conservation and your consciousness of the world around us is inspiring. Thank you for sharing you thoughts with us. May the forest also be with you!